Hello, Ribbon Lovers! 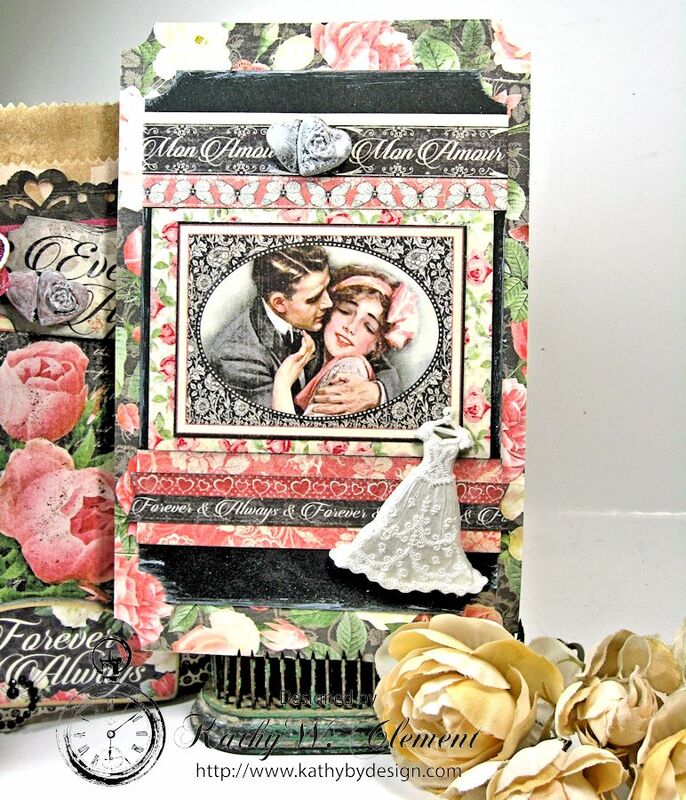 What do you get when you combine Romantic Ribbon with Graphic 45 Mon Amour Papers? Today’s project is overflowing with lovey-dovey, mushy goodness! 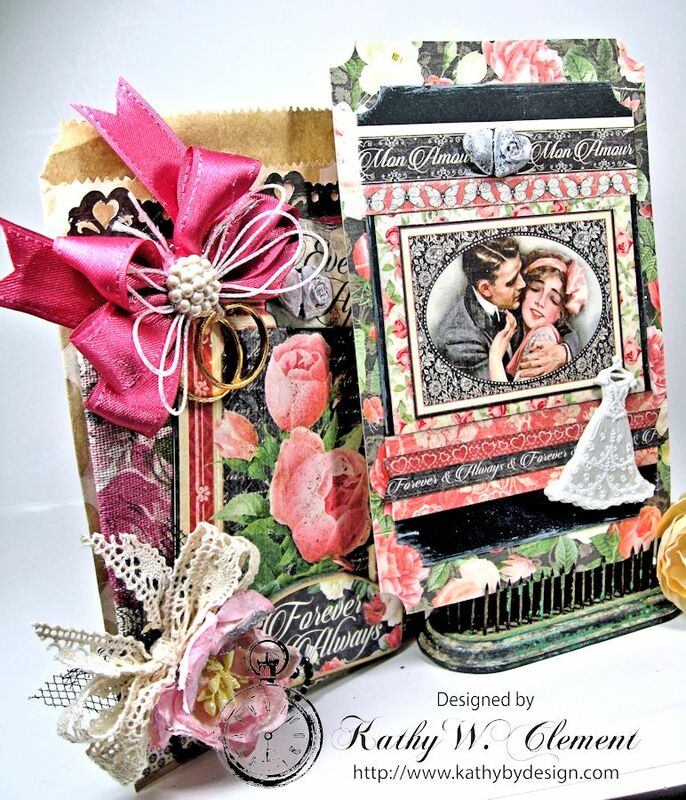 I love the new Mon Amour collection from Graphic 45, and I paired it up with the most scrumptious, romantic ribbon, trims and blossoms I could find in my stash. Get out your fainting couch, because this ribbon is swoon-worthy! Ooh-la-la! There is so much ribbony goodness going on here that I hardly know where to start! This is one of the Middy Bitty Chevron Kraft Bags all dressed up with Mon Amour papers, Garden Rose Double Sided Satin Ribbon, White Iridescent Metallic String, Tabitha Natural Crochet Lace, and a soft pink Mulberry Blossom from the Mixed Magnolia Bouquet. I used 2.5″ Vintage Garden Print Natural Cotton Ribbon to create a belly band on the Middy Bitty Bag. And I glittered the edges of the magnolia petals, too. 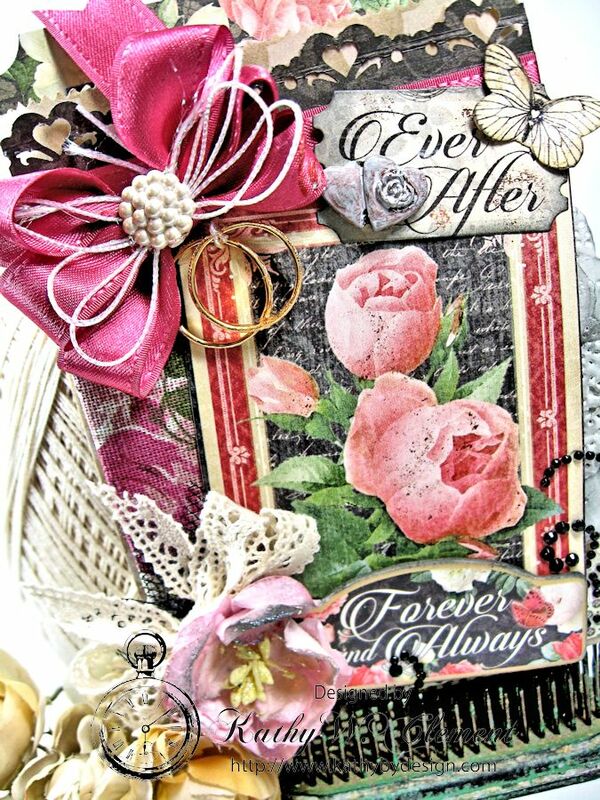 I just love all the wonderful textures these various ribbons add to the project. I thought you might like a peeky at the insert I created for this unique wedding card gift holder. I dry brushed a little white paint around the edges of my card to fit in with the shabby chic feel of this card. If you’re looking for a fun idea for your honey this Valentine’s Day, you could easily alter the sentiments and embellies just a little, and this little bag could hold a Valentine’s Day treat. 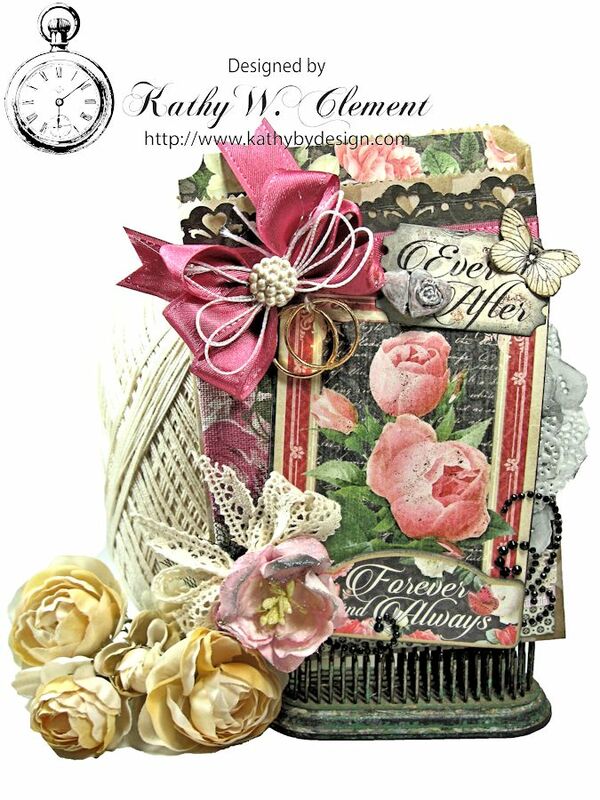 This entry was posted in Graphic 45, Really Reasonable Ribbon, Valentine's Day and tagged Graphic 45, Mon Amour, Really Reasonable Ribbon, Valentine's Day, wedding cards on January 5, 2016 by kathycNC. Oh, so very, very lovely and the little lace dress is beyond precious! Thanks, Kathy! Just Beautiful Kathy ,love the whole picture and those rings awww a lovely sentimental touch. Wow! This is stunning, you never disappoint! The ribbons and flowers are so romantic. “Ooh-la-la” indeed!! So much gorgeousnes (that is a word…right?) I love this!